Free drop-in sessions for anyone in Shoreham-by-Sea wishing to discuss their ‘later life plans’ will be available every Thursday between 10am-4pm at one of the town’s care homes. We have partnered with Barchester Care Home Kingsland House to offer appointments to the local community starting in April 2019. 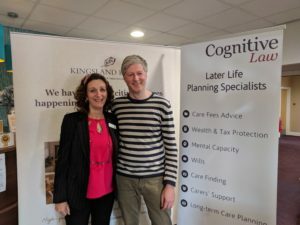 Later Life Solicitor Richard Bates will be based at Kingsland House to speak with residents, their families and anyone from the local community wanting to talk about how to plan for their, or their loved one’s, later life. Richard offers a range of legal and practical advice on all aspects surrounding planning for life in older age. These include advice about Wills, Powers of Attorney, but also care finding and care funding, as well as wealth management and protection. Richard also advises on safe and appropriate ways to reduce the impact of care fees and inheritance tax. No appointments are required; drop in whenever suits you. Tea, coffee and other refreshments will be provided, and Kingsland House will provide one of their offices ensuring full privacy to anyone wishing to discuss their affairs. Richard Bates is really excited to be available to the community in Shoreham-by-Sea and looks forward to supporting residents, staff and the local community and helping them plan for their later life.